Beautiful results and a really nice, industrial-quality setup. Big steppers, big drivers. They seem to be using a Raspberry Pi + arduino combo with discrete CNC style stepper drivers, and toothed belts for suspension. A solenoid raised or lowers the pen. It’s great to see an actual product based on this process, and some degree of automation going on too, in the image upload process. I like best that the form of the output, the direction of the lines is a succinct expression of the form of the machine – the drawings could only come out of a machine like this, and the angles at the intersections and the and centre points of the arcs are all fingerprints tied to this particular machine too. They have their counterweights running on little tracks too! That’s a good idea. 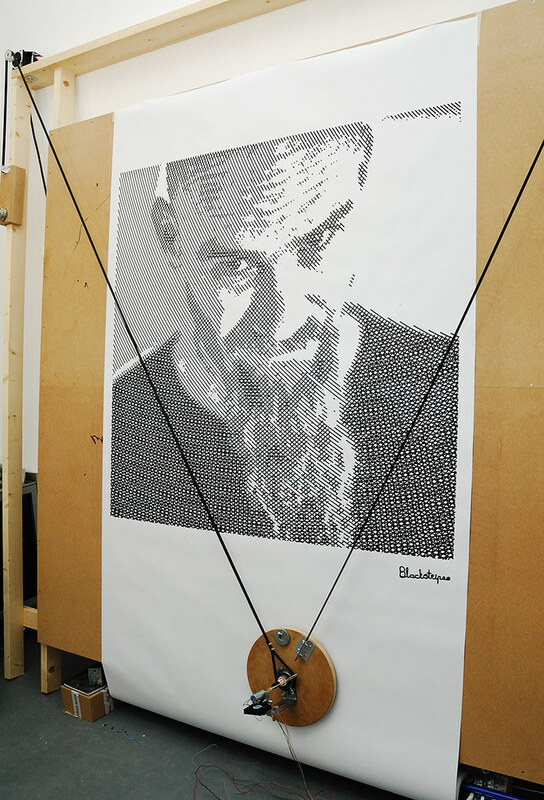 Most people think that Jurg Lehni’s Hektor was the original hanging-v drawbot. I know I owe my excitement about drawing machines to seeing that video ten years ago, but I also remember being pretty frustrated at the time that there was no instructions on how it was done, no software, no hardware. That’s always been the bit that interested me. That shows a hanging-v plotter in action, at the SIGGRAPH show in 1988 made out of Technic Lego, drawing more-or-less the same test patterns I was working with this time last year. This confirms Hektor as only the most famous (and messiest) example in a long line of revisions stretching back at least 25 years. It’s good to kill your gods every now and then. I am excited to see so much interest in the last year or two in drawing machines, and am pretty thrilled to be involved in that surge of interest – I am vain enough to like to think I have done something to help it along, and I have met lots of great new people along the way – thank you for being interested enough to harass me into doing it better! Hello, thank you to the couple of you who have been waiting a long time for your machines, and are very patient. I’m behind, for a couple of reasons: 1) New job means less flexibility in the short-term (don’t want to give a bad impression you know). 2) Worrying problem with the touch-screens. They weren’t working. Touches being registered, but position mangled, and then locking up the whole machine. Not good. Thanks to dc42 on the arduino forum, I think I have a solution. Now, the real question that I am going to shy away from asking myself is “why did this only start happening now”. I thought the lines that I find were causing the issue were inserted as a response to this problem in the first place. But I could be wrong, lost in the mists of time now. I wonder if slightly different manufacturing tolerances on the LCDs or the megas have led to a slightly different behaviour. I have moved to using the new UTouch libraries instead of the ITDB02_Touch ones (more or less the same). As ever, the updated code is in the code repo. I haven’t packaged it up, because I’m not clear that the code in the current release zip is causing any problems. At any rate, it’s only the touch-screen stuff that’s the issue. Anyway, so that’s 3) The solution. And big news: 4) I have a workshop now! I’ve rented a studio in Art’s Complex in Edinburgh – this should give me better separation of business and pleasure and lead to routine stuff (kitting) being done faster – or at least at a more reliable pace. Thanks!